PUMPKIN FUDGE PIE – Rich and decadent this twist elevates the traditional pumpkin pie to a whole new level of devourment. 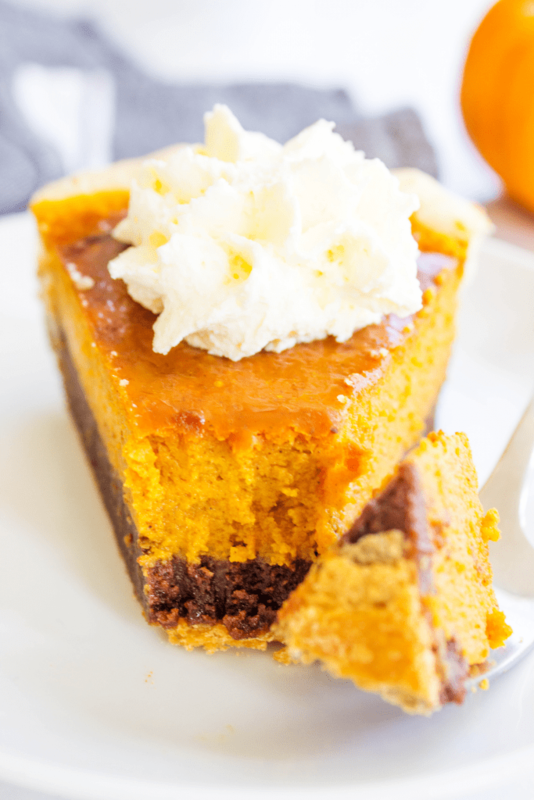 You will literally fall in love with this PUMPKIN FUDGE PIE. 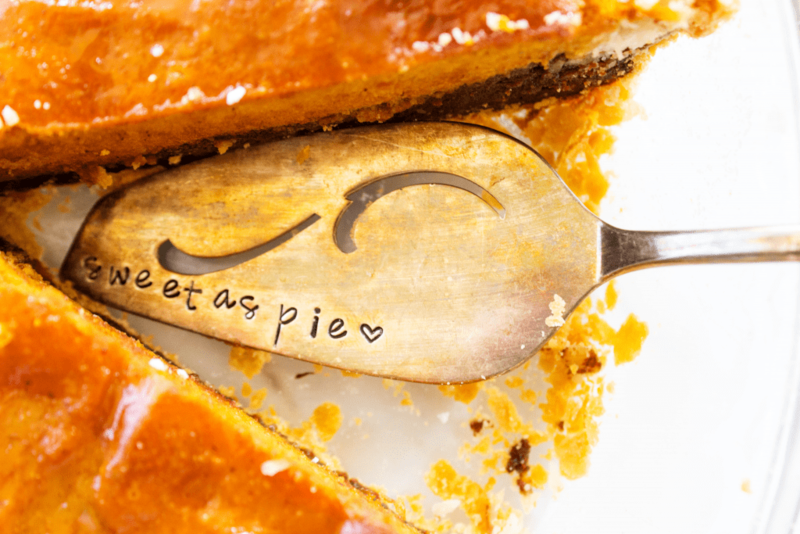 While this is the season for everything pumpkin and pie – it is okay and absolutely necessary at times to have a twist on some traditional favorites. And this chocolatey twist is just what your holiday tables needs. So bring together pumpkin and chocolate lovers with this rich decadence that will become a customary holiday treat. If you’re like my family, when you were younger, you may have had that one favorite recipe your grandma, right? You know, that generational recipe – the one you were excited to make when you got older. Well, my favorite recipe growing up from my grandma was her chicken pot pie. I loved going to her house and smelling “her” pot pies as they baked in the oven. Luckily, my dad started to “make” them too. I was in pot pie heaven. When I became a mom I decided that it was time for me to carry on the tradition of “grandma’s pot pies”. I called my dad super excited and asked for the recipe. I was expecting his typical response: “Ask mom; it’s in the recipe box.” Instead, he said, “Sandi, you can get them at the store. Grandma’s pot pies are Marie Callender’s pot pies!” What??? Come again. Are you serious?! Here’s the deal. My grandma is an amazing baker and has been her whole life, along with my grandpa who came from a line of great bakers. So when we were served the most perfectly looking pot pies, I had no question that grandma made them from scratch. And to top it off, they tasted homemade. Seriously, no freezer taste, only fresh vegetables and that signature light crispy crust, just like homemade pie dough. I was in shock because I felt totally disappointed that grandma hadn’t rolled out the dough just for us. But then came the quick realization that this may just be better because it is easier – less time spent in the kitchen preparing and more time with my kids, helping with homework, running around to after-school activities, and preparing a thoughtful dessert to complete our meal. With the holidays around the corner and the winter months ahead I know I will be having a few of “grandma’s” pot pies. Easy because dinner can be ready in an hour and all I have to do is bake! With the extra time I will have I will be making this Pumpkin Fudge Layered Pie. It completes the entire evening with this comforting, pie-perfected meal while adding a touch of the holiday spirit. This dessert was inspired from my aunt, who every year makes and brings this amazing fudge pie. I decided to combine two of my holiday favorites into one… and it’s a match made in heaven. How do you make Pumpkin Fudge Pie? In a mixing bowl, add flour, butter, sugar, and salt. Using a pastry cutter blend all together. Mix in water and egg and blend until well combined. Flour the counter and knead the dough for a few minutes. Divide dough in half and roll out right away for use, or wrap in plastic and store in fridge until ready to use. When ready, roll out 1 pie crust and place in pie pan. Melt together chocolate and butter. When melted, remove from heat and stir in sugar and beaten eggs. Stir until well combined and no visible egg. In a medium mixing bowl, combine pumpkin, sweetened condensed milk, eggs, cinnamon, nutmeg and ginger. Stir until well combined and pour over fudge layer in unbaked pie shell. Place in oven at 425 for 15 minutes. When 15 minutes is over, reduce oven temp to 350 and bake for another 60-65 minutes or until the center of the pie is not wiggly. Do not remove pie from oven when reducing heat. Remove from oven and let it completely cool. Top with fresh whipped cream and serve. 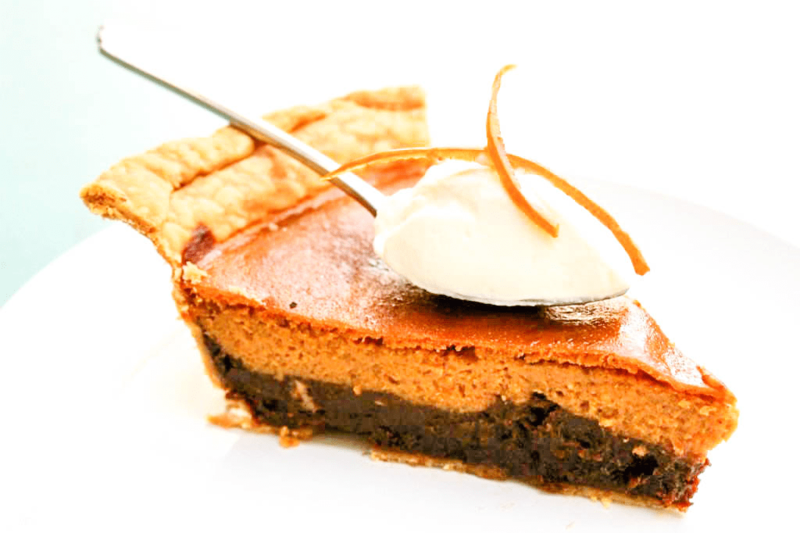 My favorite kitchen items below that I use to make this PUMPKIN FUDGE PIE. PIE PAN: You need one of these for the quiche and I prefer a glass pan over metal. One because of how it cooks and two for presentation. 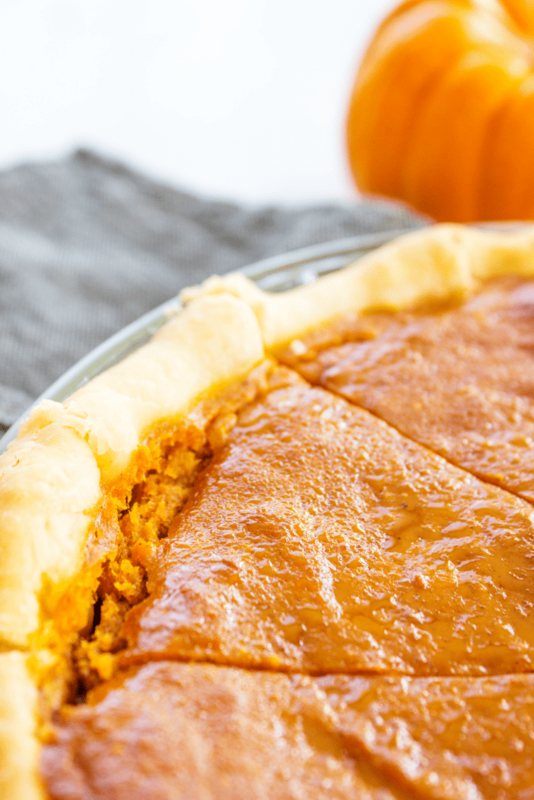 Don’t forget to pin this recipe for PUMPKIN FUDGE PIE to your favorite Pinterest board for later. In a mixing bowl, add flour, butter, sugar, and salt. Using a pastry cutter blend all together. Mix in water and egg and blend until well combined. Flour the counter and knead the dough for a few minutes. Divide dough in half and roll out right away for use, or wrap in plastic and store in fridge until ready to use. Melt together chocolate and butter. I do this over the stop top, but you could do in the microwave as well. When melted, remove from heat and stir in sugar and beaten eggs. Stir until well combined and no visible egg. Pour into unbaked pie shell. In a medium mixing bowl, combine pumpkin, sweetened condensed milk, eggs, cinnamon, nutmeg and ginger. Stir until well combined and pour over fudge layer in unbaked pie shell. Place in oven at 425 for 15 minutes. When 15 minutes is over, reduce oven temp to 350 and bake for another 60-65 minutes or until the center of the pie is not wiggly. Do not remove pie from oven when reducing heat. Remove from oven and let it completely cool. This post has been updated from November 2014. That sounds heavenly to me. I love all things pumpkin! I can’t argue with that kind of deliciousness. It sounds like a great meal to me. What a great pie! I have only ever had one thing with the combination. wow – pumpkin and fudge.. yummy combination! Perfect season to relish this as well.. nice recipe! I’ve eaten Marie Callender’s Pot Pies and they do taste home made. I’m really excite to try your pie and think I’ll make it for my Thanksgiving celebrations. Thanks for sharing it so I can serve something yummy too. Very nice and easy to follow recipe.. this may have to be made for Thanksgiving..
I’m a fan of comfort foods and I LOVE chicken pot pie in the winter. The dessert looks pretty amazing, I’ll have to try my hand at that recipe soon! Thanks for sharing. The pie looks so good. what a perfect combination with the chicken pot pie. Anything that combines pumpkin and fudge has got to be awesome! Thanks for sharing this great recipe. That pumpkin fudge pie looks so darn delicious! I love both of those flavors so this would definitely be right up my alley. This pie sounds amazing. I’ve never heard of this variety of pumpkin pie, and I can’t wait to try it out. YUM! I love their chicken pot pies, sooo good! I love your recipe too, pumpkin and fudge? Great combo! I could go for the pie and pot pie right about now. Wow! I am drooling! Pumpkin and fudge together sounds like an amazing recipe! This is too funny, but we just had the pot pies last night for dinner! My daughter loves the pies, but I try to limit them because they are not on my diet. This look so good right now, I LOVE everything pumpkin! Both of these pies look great! I grew up eating these Pot Pies. And, your pumpkin fudge pie looks awesome! This is absolutely the perfect winter meal. We go through Marie Callendar’s pot pie like they’re going out of style in the winter. I can’t wait to make this pie. That pie looks so good. I am looking more and more for comfort food now that the weather is changing here. You had me at Pumpkin Fudge! I want the whole pie!!! I’ve never heard of a pumpkin fudge pie, but it sounds amazing. I think I have a new dessert to serve this Thanksgiving. Wow, what great pictures. They are making my tummy rumble! Yummy! I love both of these! These pot pies are my favorite brand. They’re so good! That pumpkin pie looks very good as well. It’s definitely very different. I need pumpkin fudge pie, and I need it now! That’s incrEDIBLE. Yum. This looks great. Thonk you for Sharing. This sounds amazing!! I really love pumpkin pie. Sounds like the perfect combo for Thanksgiving! I love those pot pies! I just tried pumpkin pie for the first time this year and I loved it. Pumpkin fudge pie sounds amazing. I’ve actually never heard of it before, but I can’t wait to make it. I am pregnant right now and pie has been my main craving. I need to make this stat and pick up some pot pies at the store, should do the trick! That pumpkin fudge pie sounds and looks amazing! Thanks for sharing this lovely set of recipes! I have to make a desert for Thanksgiving so you have just helped me make up my mind what I am going to make. That looks so delicious! Such an amazing post. I’ve never heard about it before. I would like to make it in my home. Definitely i will try to make. Thank you for sharing..
Oh my. I need some of that pie in my life. And that pot pie looks amazing, too. 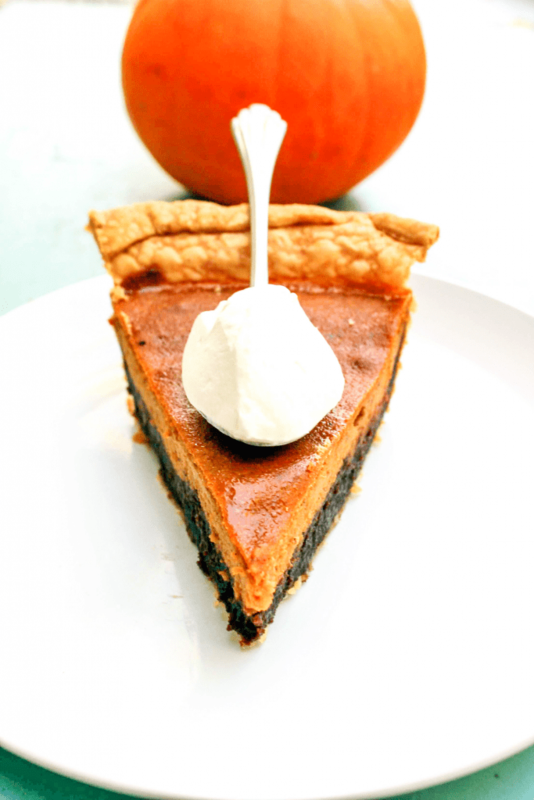 This chocolate fudge pumpkin pie looks devine! And with chicken pot pie = a dream!! This sounds amazing! I think it needed fudge! There’s no shame in shortcuts! Especially when they’re selfish! This is dinner done right! I haven’t had a pot pie so long but seeing this makes me want to make one right now. It looks really good. What a delicious pairing of two popular comfort foods. Yummy! This looks like a great meal to me. I would maybe add a small salad. The Pumpkin Fudge Pie sounds so good i wish i could taste it now. That’s the beautiful Pumpkin Fudge Layered Pie I’ve seen. Yummy! how strong is the fudge flavor? It’s a great balance, not overwhelming, you still taste the pumpkin. Enjoy!